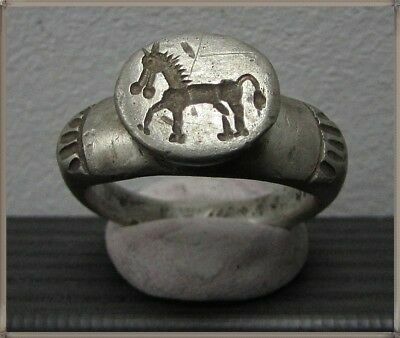 Seller: moesia_roman_empire (273) 100%, Location: Serbia, Ships to: Worldwide, Item: 302972669257 **IRON AGE**Ancient Silver CELTIC Ring **LA TENE ** 500BC** HORSE ** **EXTREMELY RARE****PERFECT CONDITION** **BEAUTIFUL HORSE ENDRAVED** Inner Diameter:18-19mm Weight:9.01g The La Tene culture was a European Iron Age culture named after the archaeological site of La Tene on the north side of Lake Neuchâtel in Switzerland, where thousands of objects had been deposited in the lake, as was discovered after the water level dropped in 1857. La Tene is the type site and the term archaeologists use for the later period of the culture and art of the ancient Celts, a term that is firmly entrenched in the popular understanding, but presents numerous problems for historians and archaeologists. The culture became very widespread, and presents a wide variety of local differences. It is often distinguished from earlier and neighbouring cultures mainly by the La Tene style of Celtic art, characterized by curving "swirly" decoration, especially of metalwork. La Tene culture developed and flourished during the late Iron Age (from about 500 BCE to the Roman conquest in the 1st century BCE) in Belgium, eastern France, Switzerland, Austria, Southern Germany, the Czech Republic, Poland, Slovakia, Slovenia, Croatia and parts of Hungary, Ukraine and Romania. The Celtiberians of western Iberia shared many aspects of the culture, though not generally the artistic style. To the north extended the contemporary Pre-Roman Iron Age of Northern Europe, including the Jastorf culture of Northern Germany. La Tene culture developed out of the early Iron Age Hallstatt culture without any definite cultural break, under the impetus of considerable Mediterranean influence from the Greeks in pre-Roman Gaul, the Etruscans, and Golasecca culture. Barry Cunliffe notes localization of La Tene culture during the 5th century when there arose "two zones of power and innovation: a Marne – Moselle zone in the west with trading links to the Po Valley via the central Alpine passes and the Golasecca culture, and a Bohemian zone in the east with separate links to the Adriatic via the eastern Alpine routes and the Venetic culture". A shift of settlement centres took place in the 4th century. La Tene cultural material appeared over a large area, including parts of Ireland and Great Britain, northern Spain, northern-central Italy, Burgundy, and Austria. Elaborate burials also reveal a wide network of trade. In Vix, France, an elite woman of the 6th century BCE was buried with a very large bronze "wine-mixer" made in Greece. Exports from La Tene cultural areas to the Mediterranean cultures were based on salt, tin, copper, amber, wool, leather, furs and gold. Although the La Tene culture had no writing of its own (rare examples of it using Greek inscriptions exist, and late Celtic coinage often uses Latin) there are several accounts of the culture and aspects of its history from classical authors, most very hostile and tending to stereotype.The preceding "Halstatt D" culture, of about 650-475, was also very widespread across Europe, and the transition over this area was gradual, and is mainly detected through La Tene style elite artefacts, which first appear in the western end of the old Hallstatt region. The establishment of a Greek colony, soon very successful, at Massalia (modern Marseilles) on the Mediterranean coast of France led to great trade with the Hallstatt areas up the Rhone and Saone river systems, and early La Tene elite burials like the Vix Grave in Burgundy contain imported luxury goods along with artifacts produced locally. Most areas were probably controlled by tribal chiefs living in hilltop forts, while the bulk of the population lived in small villages or farmsteads in the countryside. By 500 the Etruscans expanded to border Celts in north Italy, and trade across the Alps began to overhaul trade with the Greeks, and the Rhone route declined. Booming areas included the middle Rhine, with large iron ore deposits, the Marne and Champagne regions, and also Bohemia, although here trade with the Mediterranean area was much less important. Trading connections and wealth no doubt played a part in the origin of the La Tene style, though how large a part remains much discussed; specific Mediterranean-derived motifs are evident, but the new style does not depend on them. By about 400 the evidences for Mediterranean trade become few; this may have been because the expanding Celtic populations began to migrate south and west, coming into violent conflict with the established populations, including the Etruscans and Romans. The settled life in much of the La Tene homelands also seems to have become much more unstable and prone to wars. In about 387 the Celts under Brennus defeated the Romans and then sacked Rome, establishing themselves as the most prominent threats to the Roman homeland, a status they would retain through a series of Roman-Gallic wars until Julius Caesar's final conquest of Gaul in 58-50 BCE. The Romans prevented the Celts from reaching very far south of Rome, but on the other side of the Adriatic Sea groups passed through the Balkans to reach Greece, where Delphi was attacked in 279, and Asia, where Galatia was established as a Celtic area of Anatolia. By this time the La Tene style was spreading to the British Isles, though apparently without any significant movements in population. After about 275 the relentless Roman expansion into the area occupied by La Tene culture began; it would never be complete, but lasted until the 1st century CE in Britain, leaving only the approximate areas of the modern Celtic nations (excluding Brittany) unoccupied. The Romans never attempted to invade Ireland and eventually decided that expansion into north Scotland was not worth the trouble, retreating from the line of the Antonine Wall to Hadrian's Wall in 162 CE.Though there is no agreement on the precise region in which La Tene culture first developed, there is a broad consensus that the center of the culture lay on the northwest edges of Hallstatt culture, north of the Alps, within the region between in the West the valleys of the Marne and Moselle, and the part of the Rhineland nearby. In the east the western end of the old Hallstatt core area in modern Bavaria, Austria and Switzerland formed a somewhat separate "eastern style Province" in the early La Tene, joining with the western area in Alsace. In 1994 a prototypical ensemble of elite grave sites of the early 5th century BCE was excavated at Glauberg in Hesse, northeast of Frankfurt-am-Main, in a region that had formerly been considered peripheral to the La Tene sphere. The site at La Tene itself was therefore near the southern edge of the original "core" area (as is also the case for the Hallstatt site for its core). From their homeland, La Tene culture expanded in the 4th century to more of modern France, Germany, and Central Europe, and beyond to Hispania, northern and central Italy, the Balkans, and even as far as Asia Minor, in the course of several major migrations. La Tene style artefacts start to appear in Britain around the same time, and Ireland rather later. The style of "Insular La Tene" art is somewhat different and the artefacts are initially found in some parts of the islands but not others. Migratory movements seem at best only partly responsible for the diffusion of La Tene culture there, and perhaps other parts of Europe. Popularity - Super high amount of bids. 3 views, 0.0 views per day, 151 days on eBay. Normal amount of views. 1 sold, 0 available. Super high amount of bids. 3 views, 0.0 views per day, 151 days on eBay. Normal amount of views. 1 sold, 0 available.